It's our last official week before spring break! It also happens to be the week of the NJSLA standardized tests. What a combo! 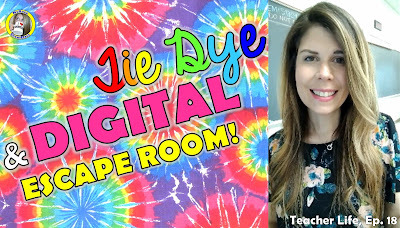 Watch how I used the extra class time to try out some new lessons - including a digital escape room to teach about the chemistry of tie dye! My students will use what they learned to create their very own tie dye tee-shirts. It was a great way to end the week! If you are celebrating, have a Happy Easter and Happy Passover! Ms. Razz is an enthusiastic chemistry teacher in New Jersey. She often counts herself to sleep at night using molecules or by reciting Avogadro's number. (For real.) She believes that every student has the power to learn anything, even chemistry. After all, she remembers this hustle didn't always come easy to her. She's also a Teachers Pay Teachers seller and you can view and purchase her lessons here. Do your students like group work? Mine didn't, and I decided to find out why. I'll offer advice on how I support my students learning interpersonal skills yet solve one of the biggest group work dilemmas. 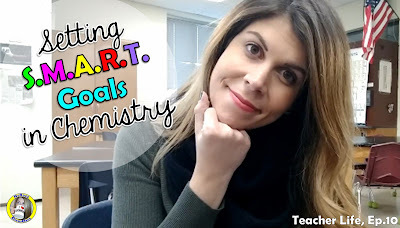 I'll also share some resources I use in my classroom (POGIL) that help to encourage communication and collaboration while learning chemistry. 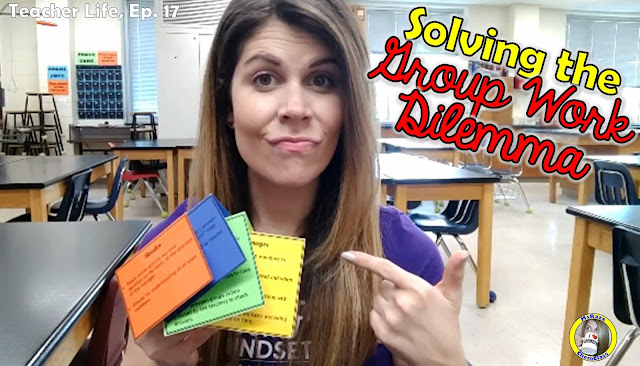 I hope this post inspires you to find ways to develop your students' interpersonal skills and find balance during your group work activities! Thanks so much for watching! This week we kicked off our study of kinetics by investigating the factors that affect reaction rate. My chemists created their own experiments to understand the effect of changing concentration, temperature, and surface area on reaction time. It was amazing to observe my chemists' meaningful discussions about their data, as well as hear them construct explanations for their findings. I'll also show you the scaffolding I created to help my chemists think about their experimental design. 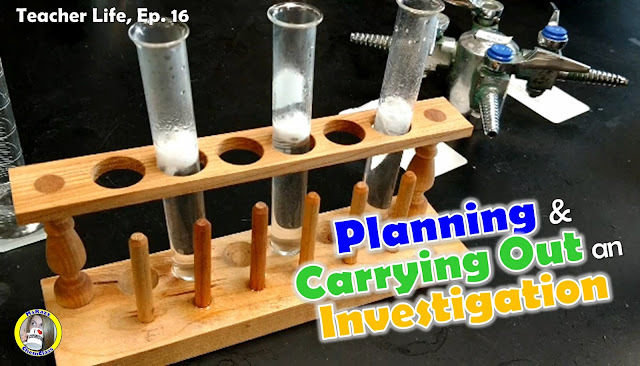 I hope this vlog will inspire you to try having your chemists design their own investigations! I've been in a little bit of a worksheet rut. Our celebration of learning (aka unit test) on solutions is next week. So instead of the same old study guide, I mixed it up with student-reflection and choice! As an added bonus, I incorporated some tech using QR codes. My chemists' discussions were amazing during the review, and I was able to do lots of small group instruction with struggling learners. For our lab this week, my students performed titrations and I will discuss how I NGSS-ified this "cookbook" lab. 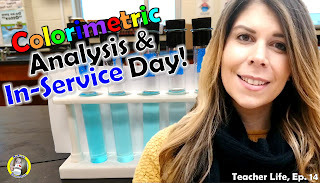 Colorimetric Analysis and In-Service Day! This week seemed to fly by! The focus was on the quantitative aspects of our solutions unit. I made a series of flipped learning videos that explained units of concentration, making stock solutions, and dilutions. At the end of the week, the students were challenged to make their own stock solutions and dilutions. They were then able to reflect on their solution making skills by comparing their dilutions to unknowns using colorimetric analysis. Finally, this week finished on a very high note with an incredibly inspiring in-service day. Thank you so much for watching. 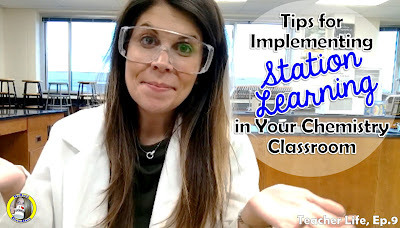 As always, I hope my vlogs are inspiring you to include more student-centered learning into your classroom culture. A new phenomenon for my solutions unit! Hi! It feels so good to be back! It was my first full week back to school since battling pneumonia. Fortunately I am feeling better, and returned to school with a quite a few fun and engaging activities. We finished our unit on stoichiometry by designing an airbag using knowledge of molar volume and mole conversions. At the end of the week I introduced our new unit, with, you guessed it, a phenomenon! For a different change of pace, I dug out the Mr. Sketch markers and poster paper for a Phenomodeling activity. It was great to see my students relate their prior knowledge and experience to this phenomenon. Finally, on lab day my students participated in an inquiry lab that introduced saturated, unsaturated, and supersaturated solutions. It was a busy week in Ms. Razz's class that is for sure! It was a shortened week between President's day and a surprising early dismissal. But that didn't stop us from finishing our electrochemstry unit and diving into our unit on the mole. 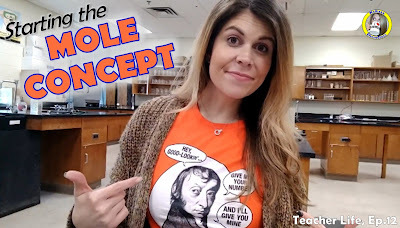 Watch how I use an incredibly simple activity to introduce the mole concept with manipulatives. Try it with your classes - you will be amazed how quickly your students will be performing conversions with the mole and ACTUALLY UNDERSTANDING the relationships! As always, I hope you feel inspired to incorporate more manipulatives and student-centered learning into your classroom! Have a great week! I hope you are celebrating with an extra day off, that is if you didn't use too many snow days already! It was quite an exciting week with an unexpected snow day and some Valentine's day festivities. We still got to flex our chemistry muscles though - we wrapped up our chemical reactions unit with some station learning and a summative assessment. We also began our unit on electrochemistry with, of course, a new phenomenon! 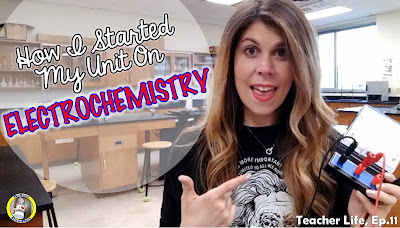 This week I'll share some of the stations I used to help my students prepare for their summative assessment and explain how I began my unit on electrochemistry using a fantastic POGIL that incorporates a phenomenon! As always, I hope you find something valuable to bring back to your classroom this week! Thank you for watching! I hope you had a great week with your students. At last midterms are over and, as you might expect, I didn't waste any time getting back into the full swing of things. I did, however, start off the second semester differently than I have in the past. Reflection has always been a big part of my classroom culture, but I thought I would switch things up a bit and have my students focus on goal setting for the second semester. I thought this would be a valuable exercise because I've been writing my own goals down, and have had much success working toward and achieving those goals. To my surprise, this isn't a coincidence. After doing some research, I found that writing your goals down can actually help you make strides to achieve them! I then thought: this would be a great way to support student reflection and help improve their performance. A win-win in my book! So I created a digital interactive notebook (DINB) for my chemists to do just that. The notebook walked them through the goal-setting process and at the very end, they set their own S.M.A.R.T. goals. I've been very pleased with the goals my students have produced. I must make sure, though, to revisit these goals throughout the semester so my students can check in on their progress. 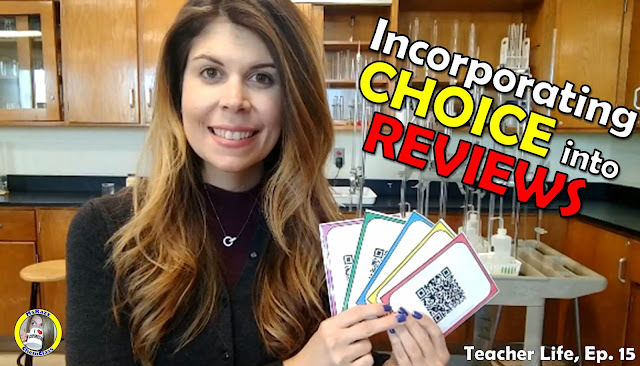 This week's vlog includes all the details of my goal-setting digital interactive notebook, an inquiry-based single replacement lab, and how I teach my students to predict products for different reaction types. As always, I hope you find something valuable to bring back to your classroom! Midterms are here! Here's what I do with my 'free' time! Midterm season is here! Amazing how quickly the first part of the year is over. I love this time of the year though - I always find that I have a lot more time on my hands. It makes sense though - I'm not as busy planning new and innovative lessons for my classes. Instead, I spend the midterm exam days grading, but also getting ready for a productive and enjoyable second half of the school year. 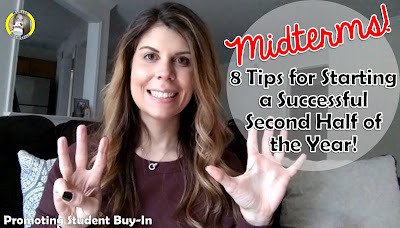 I hope you'll find some inspiration as you gear up for a wonderful second semester with your students. Need help managing the chaos of station learning? Needless to say, my students and I jumped right back into our study of intermolecular forces using station learning. It's been a while since we've done station learning, so we needed to review our norms. Interested in what those are? View my vlog to learn about how I communicate my expectations, minimize disruptions, and avoid chaos! 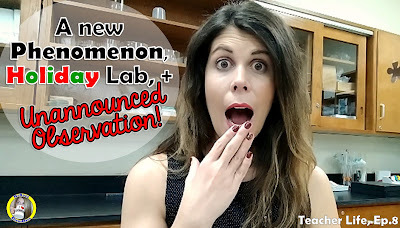 Holiday Lab, New Phenomenon, + Unannounced Observation! I hope you are enjoying some downtime with family and friends as we gear up for the holidays! 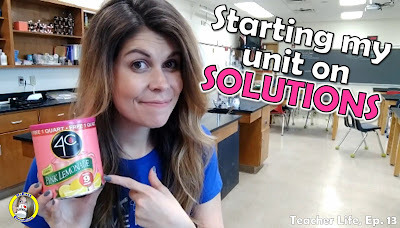 It has been a very busy couple of weeks, but I did find some time to share how I started my unit on intermolecular forces and prepped for a holiday lab. I'll also give details on how my unannounced formal observation went. Wishing you a very happy and healthy 2019! See you next year! This week I share how I bulk up my card sorting activities to actually teach content! 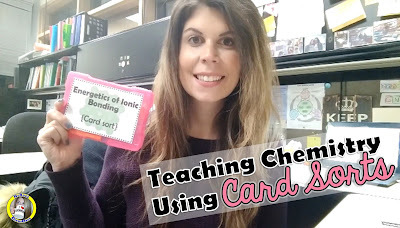 Watch as I discuss how I taught the energetics of ionic bonding using a card sort. I'll also share how I incorporated an easy way to help my students keep track of their journey through a card sort using Google slides. I hope this week's vlog will help to support and encourage you as you invest your precious time creating student-centered experiences. Thanks so much for watching! Visit MsRazz ChemClass's profile on Pinterest. Copyright 2018 MsRazz ChemClass. Powered by Blogger.